The truth is, Mother Nature sometimes gives winemakers better conditions to work with, but no individual winery has a “good vintage” unless the winemaker does a good job. Take the 2008 vintage in Oregon. The word went out very early that it was one of the better vintages in several years, and wine drinkers got their palates set to enjoy some really good stuff from their favorite wineries. But 2008 was not an easy growing season. Nature through all kinds of stuff at Oregon vintners, including cool spring temperatures that delayed flowering, higher-than-normal summer rainfall, and early October frost. Vineyard managers and winemakers had to make some tough decisions, including how much to thin the crop in order to produce the best quality fruit. Here’s my point: Rollin made some great wine that year (which I know because I just tasted one), and not everyone else did. 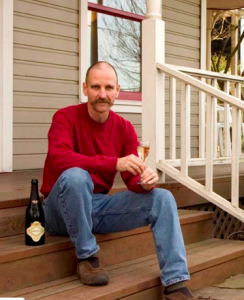 Rollin is the winemaker and owner of Argyle Winery in Oregon’s Willamette Valley. He’s got some perspective on good and bad vintages, because he’s been growing and making wine in Oregon since 1987. And he hasn’t just been goofing around. 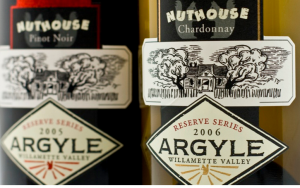 His winery has earned all kinds of 90+ ratings from the big-name wine reviewers; his wines have made Wine Spectator’s Top 100 list more often than any other Oregon winery; and Spectator named Argyle “Oregon’s Premier Winery” in 2000. So yeah, the guy knows how to make great wine, even in a not-so-good vintage. Of course, he’s got some good tools to work with, like the Lone Star Vineyard that produces the fruit for Argyle Nuthouse Pinot Noir Willamette Valley 2008. The Lone Star Vineyard is in the Eola-Amity Hills appellation, but it sits at a relatively low elevation and its orientation is such that it’s drenched with sunshine from the moment “the first light of day peaks over the Cascade range” until late in the day. What does this extra radiant heat do? It produces more intense black fruit flavors and good structure. So to get to the point: the nose of this Nuthouse Pinot surprised me right off the bat. From Willamette Pinot I expect delicacy, not rich berry fruit. But rich is what I got, with lots of juicy black cherry and baking spices. The flavors were just as juicy, with more sweet berries, a rich mid-palate, and just enough acid to balance the fruit. The velvety mouthfeel turned into a finish that was somehow bright and fun. There’s both boldness and elegance here, and I think it’ll age very well. I’d like to try it again in a year or two and enjoy it all over again.